Sightseeing of the White House, Lincoln Memorial, Smithsonian museums and more. 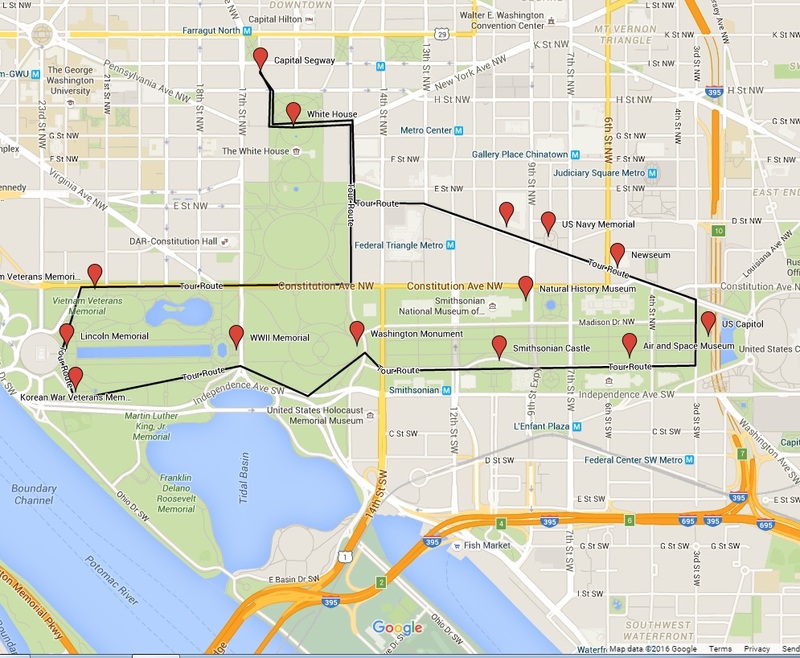 Highest Rated tour of the Washington sites in a fraction of the time. Delight in the historical monuments and memorials of Washington, DC, all from the wheels of the world’s coolest machine, the Segway® Personal Transporter (PT)! Seeing all the attractions and monuments in Washington, DC can take days. Don’t waste time walking extra miles. Take a Segway PT Tour of DC and cover an entire day’s worth of sightseeing in under three hours. You’ll glide through the United States capital on a simple-to-use, fun-to-ride, technological breakthrough, Segway PT, exploring historical sites like the White House, Lincoln Memorial, Washington Monument, National Mall, Smithsonian Museums, and more. And when it’s over you’ll still have plenty of time to tour even more of Washington, DC. We only do ONE THING, Segway PT! And when you are the best, other companies want to copy that success. But, they can’t, so …. their tours offer bikes, pogo sticks, and other gimmicks to entice you. But, you’re not fooled! With over 3,000 REAL reviews “who have taken the tour and not written by their own employees” you will find out why DC has once again chosen us as the BEST TOUR IN DC! Using the Segway PT was easier than we first thought and practicing in the park was a good way to improve our skills prior to “real” use. The tour was a good way of seeing the highlights without feeling worn out or tired. The cost was not overpriced as the whole experience was very enjoyable and worth much more. Our tour guide, Tyler, was patient, informative and an excellent resource for questions. The traffic and pedestrian interaction was not a problem, and rolling along the entire route was very smooth and easy. We would recommend the Segway PT tour as an easy way to see the highlights without the physical exertion of walking or other methods of transportation. Riding the Segway PT was enjoyable in and of itself. 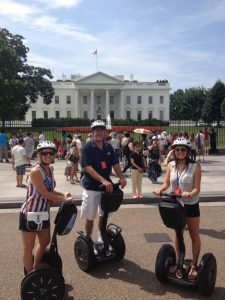 Capital Segway offers the only Segway® Authorized Tour of Washington, D.C. and all its famous attractions. Others, only claim to be. Don’t miss a word! Capital Segway is the only Segway PT tour using state-of-the-art Vox© radio headsets. Segway PTs have a top speed of 12.5 mph. We DO NOT limit your speed. Other “unauthorized” Segway PT tour companies use the “black key” or use the “turtle” mode, limiting your speed up to 6 mph. We believe in riding the Segway PT the way it was meant to be ridden! Our equipment is always new. In addition to changing our tires and providing maintenance on our fleet daily, Capital Segway is also the official dealership and service center for the DC Metro area. Each tour begins with a short Segway PT safety orientation and training session to have you gliding like a pro in no time. All tours are led by local Washington, DC experts who love their job. Our tour guides have been doing tours for years now and you are welcome to try and stump them! We are the local favorite! The Washington Capitals, DC United, Things To Do DC, Professionals in the City, DC Photo Safari, and many locals take our tour daily. The ONLY Segway PT tour in town that can offer it in French, German, and Spanish. Available per request. Call us at 202-682-1980 and we can set that up! Military Discounts with valid ID, call and inquire about a military discount! Student rates are available – call 202-682-1980 for information! We offer special group rates and Segway PT tour gift certificates – the perfect present for any occasion! Call 202-682-1980 for more information.